Are you looking for Dog Bone Recipes? Well, then, here you go? We've listed several different dog bone kinds of recipes for you to try whenever you get the time and the chance to cook. So, if you are looking for a healthy and flavorful gourmet dog recipe that will not irritate your dog's sensitive stomach or allergies, then please try these for yourself for your dog! I would suggest you get some simple cookie cutters when making these Dog Bone Recipes for yourself to help with portion control. If you have a dog that is allergic or has a sensitivity to corn or some other type of grain of ingredient in dog foods then any of these may be the recipe for you! You may even think that it will be overly time-consuming to make your own dog biscuits. I have found that by pre - making several batches ahead of time that that really is not the case. If you wanted to you could even eat these dog bone recipes yourself. 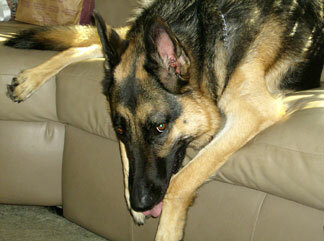 Your dog will love them, so try them out and share with your own German Shepherd today! Combine ground meat and chicken broth in a bowl. Add the black beans and cottage cheese. Add soy sauce. Mix all of the ingredients together thoroughly. Mold the mixture into bone shapes and place on a cookie sheet. Bake this Dog Bone Recipes for 45 minutes in a 375 degree oven. Let cool. In a large bowl, dissolve yeast in warm water. Add salt, one beaten egg, and the warmed chicken broth. Add all flour except the all-purpose flour and mix well. Slowly add all-purpose flour until a stiff dough is formed and it can be kneaded by hand. Knead for only a couple minutes, just enough to get the dough to hold together.Roll out dough about 1/4" thick and cut with cookie cutters, Place biscuits on a large cookie tray and place directly in a 300 degree oven, they don't need to rise. Bake for 45 min. and then turn off the oven. You can let them sit in the oven overnight and in the morning they will be real hard and good for your dog's teeth. You could also vary this recipe by adding milk for a milk-bone type biscuit or shortening for a little extra fat. Try different liquids and even honey or molasses, Check with your veterinarian for any other nutritional suggestions. Combine all ingredients in food processor, process until well mixed, mint is chopped, and a large ball forms. Press or roll on non-stick surface (floured board or ceramic) to a thickness of 1/4-1/2". Cut into 1x2" strips or with bone-shaped cookie cutter and place on non-stick cookie pan. Bake at 375° for 20 minutes or until lightly browned. Cool and store in air-tight container. Makes about 30 medium biscuits. In a separate bowl, mix flour and oatmeal. Pour liquid ingredients into dry ingredients and mix well. Press onto an ungreased cookie sheet and cut into shapes desired. Bake at 300 degrees for 1 hour. Turn off heat and leave in the oven to harden. Refrigerate after baking. Tell us all about your favorite dog treats! Do you have a great story about your Favorite dog treats? What exactly are they? What are they made of? Where do you by them at? Share all about it right here!